As far as I can see, Db3 does support "date format" with a 'D' char after the attribute name. 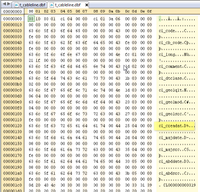 I had an hex look with Neo to the dbf file I sent, you can see that it's a Dbase '3' and that there is a 'D' after cl_creadat. That's likely why Qgis table manager plugin recognizes also it as Date.